You would have thought Mr. Bret Stephens, the up-and-coming climate-confusionist hack hired by the New York Times to general scorn, would have been on his best behaviour after the virulent reaction to his first column. Well, here’s the second, and it’s no better. Stephens uses the alleged failure of three climate policies – corn ethanol, the European Emissions Trading Scheme, and the German Energiewende – to undermine the idea of climate mitigation. Imagine such coward’s reasoning – this may not work, let’s do nothing – applied in medicine or war. There’s also been some acknowledgment that Germany’s Energiewende — the uber-ambitious “energy turn” embarked upon by Angela Merkel in 2010 — has been less than a model for others. The country is producing record levels of energy from wind and solar power, but emissions are almost exactly what they were in 2009. Meanwhile, German households pay nearly the highest electricity bills in Europe, all for what amounts to an illusion of ecological virtue. First, a fact-check digression. “Embarked upon by Angela Merkel in 2010”? It took me under a minute to find the Wikipedia article on the Energiewende. The term dates back to 1980; “in its present form it dates back to at least 2002.” The first feed-in tariff dates back to 1991, though it wasn’t very successful. The key legislation, the Renewable Energy Sources Act (EEG) , was adopted in 2000 at the instigation of the Greens, then junior partners in a coalition government. It has been revised several times since. The Energiewende has been multipartisan German policy for over 17 years. That’s mere ignorance and carelessness. The dishonesty is in the claim that “emissions are almost exactly what they were in 2009”. I thought I would have to spend another minute or two with Google to find the data, but they are right there in the link he provides in the online version. 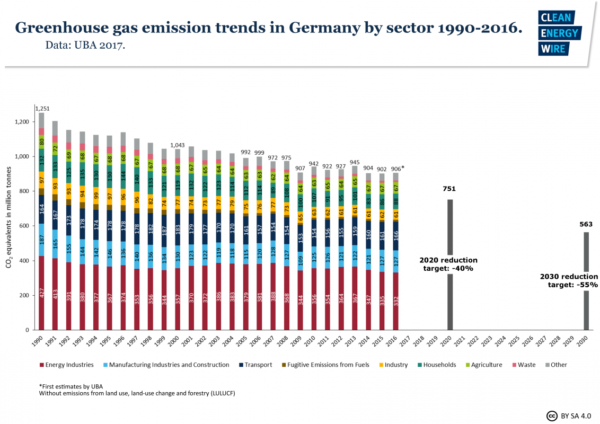 Here is Clean Energy Wire’s chart of German GHG emissions since 1990. Notice the dip in 2009? That was the global recession following the great financial crisis. The trend is of a smooth, gradual decline. If you smooth roughly by averaging the three years 2008-2010 and 20014-2016, the decline over 9 years is from 941 GT to 904, or 4%, or 0.4% a year. The uptick in 2016 is an outlier for different reasons: it was an unusually cold winter, 890,000 refugees arrived in the country (over 1% of the population), and it was a leap year, which alone increased consumption of everything by around 0.3%. Here’s a comparable chart for the USA from the EPA up to 2013. Emissions did not fall at all over the period, and they only peaked in 2007. I don’t think I have ever seen a more blatant example of cherry-picking in my life. It’s not a sophisticated error: Stephens consciously chose the one outlier. He could have made almost a strong a point without lying. “For all the billions spent on renewables, German emissions have only been falling at [0.4% or whatever the trendline is] and the country is on track to overshoot its 2020 emissions target by [100 million tonnes a year or whatever]”. But no, the shiny lie is a bit stronger and will get a few more clicks, so I’ll go with that. Faugh. Falsus in unum, falsus in omnia, as the man said. There are several inferences to be drawn from this. 1. The NYT fact-checkers are either asleep at the wheel or else operating on an absurdly restrictive rule of literal truth-telling, allowing both suggestio falsi and suppressio veri. So much for the advertised commitment to truth. Many readers of the column only had the print version, without access to the self-refuting link, so the excuse that readers can always follow it is unsound. 2. Stephens would not have lasted long in the shops of Cold War propagandists like Willi Münzenberg or Melvin Lasky. They had standards of rigour and effectiveness that ruled out mere adolescent sophistry. 3. The climate realists have won the argument, if Stephens is the best the Kochintern can muster. There are things to be criticised about the Energiewende from a conservative free-market perspective, and much more from a social-democratic climate hawk one: but Mr. Stephens no longer deserves the presumption of good faith, so I’m not addressing him. Yes, current German policies are not ambitious enough. That goes for almost all countries. Germany has a stronger consensus than most, and a more robust policy framework, for doing better. The FITs (plus no residential permitting and streamlined paperwork) worked fine as subsidies for early deployment of wind, solar and biomass, since they were neutral between suppliers and left incentives for efficiency and cost reduction intact. The FIT reductions were pretty predictable and tracked the fall in costs quite well. Germany, like most countries, has since shifted to auctions for utility-scale projects. Auctions work even better, except for cooperatives who face unacceptable project risks. This is a big drawback for proponents of energy democracy, a significant part of the consensus coalition. German ratepayers paid for the great German solar boom of the 2000s that drove world prices down to grid parity, and will keep paying until the high early FITs expire after 20 years. This was and is a great gift to the rest of humanity. We would not have 3c/kwh solar in the Gulf today without it. Current residential solar FITs are about a third of retail electricity tariffs, so there is next to no subsidy looking forward. Armchair policy logic suggests that Germany should, like everybody else, have kept their nuclear reactors going until they become unsafe or too expensive to repair. The premature closure of the reactors has kept coal burning unnecessarily high, extending the life of many coal plants by perhaps a decade.This critique ignores political realities. The Energiewende, and its political patron the Green party, started out as an anti-nuclear movement, later extended gingerly to opposition to fossil fuels. The solid political consensus for the Energiewende rests on an equally solid consensus against nuclear. Second, the coal lobby remains strong (channelled through the SPD with its ties to unionised miners). Renewables were deliberately slowed down in 2014 to protect miners and incumbent coal generators, or at least give them a soft landing. A fast coal phaseout would have been politically very difficult regardless of the nuclear policy. Commenters: please avoid relitigating this. No German is listening. The policy has a gaping hole on transport. Incentives for electric cars are negligible, charging infrastructure is still poor. There is little awareness of the health costs of air pollution, and SFIK no German cities are in the van on fighting it through low-emission zones or diesel bans or electric buses. The powerful German carmakers have ambitious electric vehicle plans but few models in production. They amble forward with the young St. Augustine: “O Lord, make me electric, but not yet”. I have been predicting that super-cheap wind and solar upends the statist logic of German policy, and that of other European countries. The idea was for technocrats to steer the volume of renewables, first through FITs, more recently through auctions. This was inevitable when they were expensive and depended on subsidies to move ahead at all. But onshore and even offshore wind is now competitive without subsidy in many places. Solar soon will be, once residential batteries become cheap enough for large-scale self-consumption. At least one British solar developer has subsidy-free projects aimed at large consumers like airports. How can governments keep control of renewable volumes in future? EU law requires open access to markets. They could walk this back, but the policy would be very contentious and unpopular. The Energiewende is going to speed up.